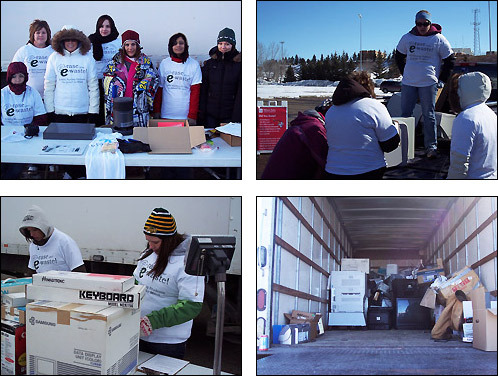 Minot State University public health nursing students are organizing a community-wide "e-rase your e-waste" recycling event on Wednesday and Thursday (April 1-2). The MSU Dome's north parking lot will serve as the collection site for the event. On Wednesday (April 1), recycling will run from 7 a.m. to 7 p.m. On Thursday (April 2), recycling will run from 7 a.m. to 1 p.m.
"Our class sees this event as an opportunity to educate the public about the health effects of hazardous waste, and how we can go green by recycling these items," said Tiffany Johnson, a public health nursing student. "We hope this project is successful and the community becomes aware of the importance of going green for future generations." Students and residents of Minot and surrounding communities can recycle old, unwanted or outdated electronic equipment, otherwise known as "e-waste." E-waste implies computers and components, fax and copy machines, cell phones, televisions, videocassette recorders, stereos, lamps and video game systems. "Many people don't realize that part of the responsibility of owning electronic equipment is disposing of it properly when we are done using it," said Nikki Medalen, instructor of nursing. E-waste contains many toxic substances, such as lead and arsenic, which can cause disease and illness. Discarded e-waste accumulates in landfills across the nation. Over time, toxins leach out into the soil and water where they do the most harm. "E-rase your e-waste" aims at reducing the amount of e-waste going into community landfills, ultimately keeping it out of residents' bodies. The cost of recycling e-waste, or e-cycling, is 40¢ per pound on eligible items. This small fee covers the cost of e-cycling and ensures that proper methods are used to dispose of the items. Tatooine Electronic Systems, Inc., will take the collected items to an e-cycling facility in Cheyenne, Wyo., for safe, environmentally friendly disposal. Ultimately, e-cycling will provide a safer, healthier community for future generations. For questions about this "e-rase your e-waste," contact Medalen at 858-4476 or nikki.medalen@minotstateu.edu or Johnson at tiffany.johnson@my.minotstateu.edu.